It would seem wrong to refer to Elementary as a “cop show”: this is primarily a story about Sherlock Holmes and Joan Watson, who function as freelance investigators who work alongside police, and whose methods and role in investigations are clearly distinct from the detectives they work alongside. However, at the same time, the presence of Bell and Gregson in the series means that this is a “cop show,” even if on a technicality in most weeks. 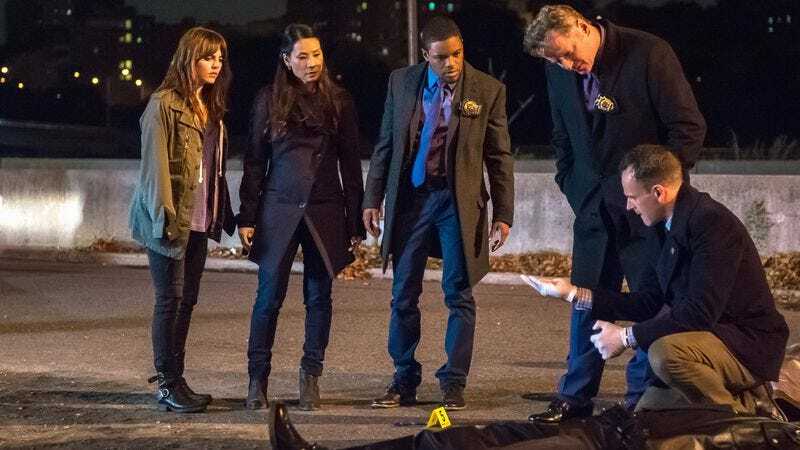 I’ve spoken a lot about the series’ refusal to step away from a “murder of the week”—rather than “mystery of the week”—format, and it has the effect of centralizing the NYPD’s place in the series even in episodes where neither Bell nor Gregson gets a meaningful role to play. At some stage, it was decided that the only cases that would merit Sherlock’s attention would be those that either begin or eventually result in murder, which at all times necessitates the NYPD getting involved and bringing the show into the space of the precinct, its interview room, and the role of law and order in Sherlock and Joan’s work. “End Of Watch” functions as one of the first episodes of the show since Bell’s shooting last season that has felt distinctly about the idea of the NYPD. When a highway patrol cop is shot while on duty, it’s “all hands on deck” for the police, who rally together to find the man who killed Alec Flynn and replaced his sidearm with an airsoft pistol. They begin planning the full Inspector’s funeral, and dispatch sends out the “Final Call” for Flynn, bringing his watch to an end. 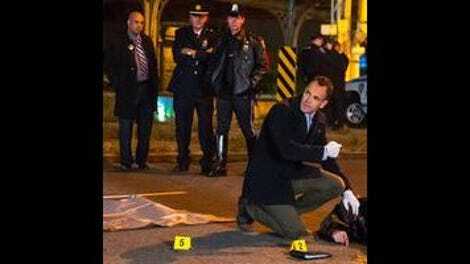 Whereas such shows of support for the NYPD’s own is commonplace on shows that more overly focus on the police as an institution—CBS’ own Blue Bloods is the most recent example—this is one of the few times Elementary has made the NYPD itself so central to an episodic story, and they become even more central when Flynn is revealed to be a drug addict who stole weapons from the armory to support his habit, and got himself embroiled in the world of a gunrunner with a deadline and a plan to raid the NYPD’s armory. It’s not a bad procedural case in and of itself: there’s never any attempt to create mystery surrounding the perpetrator, with the solution relying on connecting dots gathered throughout the episode as opposed to a major “reveal” or something similar. There’s some absurdity to the notion that even during an Inspector’s funeral there would be enough of a lapse in security at a police armory to allow for a heist on this scale, but it works as a catalyst for the end of the story, and creates a sense of episodic resolution despite coming long after we knew the killer’s identity. The episode allowed the reveal of motive to function as a climax, which helps make up for recent episodes—thinking back to the Map episode, in particular—where the motive was treated as an afterthought. The problem is that the focus on the NYPD in “End Of Watch” feels like an afterthought. When Bell rushes in to arrest Nico, this is intended to be a moment of resolution: Bell notes he’s using the second murdered cop’s handcuffs as a symbol, and then he parades him past a collection of cops waiting to stand in judgment of this cop killer and in memory of their fallen brothers. The problem with this scene—beyond the concern that this was all a giant ruse for an even bigger heist at an even bigger armory—is that the sudden interest in the idea of the NYPD has nothing to tether itself to. Aidan Quinn has presence as Gregson, and we believe his frustration at the reveal of the dirty cop and his pain when the second cop get gunned down, but he has no personal connection to this. Similarly, Bell is a key procedural part of this case, but the episode doesn’t even make an effort to tie back to how Bell’s shooting has solidified his commitment to his job. It’s not about either of them, and Sherlock and Joan aren’t present, so what am I watching in that scene other than the same NYPD storyline that any other New York set crime show could do? It’s not a terrible idea for a storyline of a crime procedural set in New York, but it lacked the specificity to make it feel like it fit this atypical and decentered “cop show” and its characters. That being said, the episode was a nice example of how Kitty’s introduction has freed up the show to explore its side storylines more naturally in the midst of an investigation. Although I speculated when the season began that they might consider adding a secondary case due to Joan and Sherlock’s separation, they have largely used it as a division of labor the way it functions here: Joan and Bell team up to explore some leads, while Kitty works alongside Sherlock on others, or some other combination therein. It’s an effective way to work through even somewhat limp stories, but it’s also a good way to be able to have people break off to explore other story angles temporarily, knowing that the case itself isn’t being entirely ignored while it happens. “End Of Watch” begins and ends with Sherlock at a meeting, a space the show hasn’t necessarily mined as often as one might have expected. It’s a useful device to frame episode themes, for example, if the writers were so inclined, but it has never been positioned as a space of answers or insight. It is a space of struggle, for Sherlock and for his fellow addicts, and “End Of Watch” is at its best exploring that struggle. When Sherlock is approached by a fellow addict about his quotes from meetings being used online to help inspire other recovering addicts, Kitty offers to discover the man’s identity, leading Sherlock down a dark path of threatening a fellow addict in an effort to get the site—named TheBrainAttic for Sherlock’s metaphor—shut down. He’s successful after blackmailing the man—who was inspired to stay sober by the quotes, and was only using them to potentially help others the same way—with the affair Sherlock observed immediately, but has been repressing because he believed the meetings to be a space where anonymity was paramount and where he and anyone else wouldn’t be subject to such scrutiny. It’s a dark moment for Sherlock, and Jonny Lee Miller successfully captures the sense of terror Sherlock feels in that moment. He feels that this thing he has come to value has been violated, to the point he no longer feels comfortable sharing in the following meeting. It seems selfish on the surface: presented with evidence that his advice is helping someone, and could help others, Sherlock blackmails the man to shut the site down. At the same time, though, sobriety is intensely personal, and Sherlock is terrified at feeling too “unique” in the context of meetings; as he says to Kitty, in another quotable and potent commentary on the experience of living as an addict, the meetings are—or were— in Sherlock’s words “the one area of my life where I feel part of the crowd.” That was something the man who started the site couldn’t have known, because he was foregrounding his own experience with sobriety—the quotes helped, so they can help others too—in a way that is only logical. Sherlock wasn’t crazy to react the way he did, nor was the man insane for wanting to do good with Sherlock’s words, but they ran head first into their respective and distinct relationships with that space and the sobriety tied to it. I wonder if the discovery that “airsoft guns that look like real guns” are illegal in New York was made before or after the script went to the draft stage—it made for a nice moment of attention to detail that they were able to limit their search to New Jersey, but I wonder if it was a late discovery when researching the script. I also wonder how those more familiar with the canon than I am react to episodes where—based on the Twitter account, and based on my presumption watching the episode without it—that rely heavily on the canon. I thought the canonical wisdom was well handled here, but it didn’t have a significant impact on me in the way it might have others. I am going to presume that the character name “Riggs” in a storyline about a high school football player turned drug dealer was not a coincidence, and that someone in the writer’s room is a Friday Night Lights fan. Sherlock says in the first meeting that he struggles with the “dull routine of existence,” which is a dangerous phrase to utter in a television procedural, a genre where the routine of existence is the very essence of the genre. While I won’t go so far as to create a “Windows Tablet Watch,” it was interesting to see the overt product placement return after seeming like Microsoft had taken some time off. Maybe there’s a custody agreement with another show or something. If you received a “KNOCK KNOCK” text from an unknown number, would you ever answer “Who’s there?” Wouldn’t you explicitly avoid answering with the continuation of the joke in an effort to subvert the joke teller? My thanks to Genevieve for filling in last week, and drawing the unenviable task of unpacking the show’s clunky handling of Sherlock’s diagnosis of Joan’s relationship problems. Clyde Watch: So we’re entering the holiday break with the count at an even 4 for Clyde and 4 for No Clyde, so if the Elementary writers are looking for a New Year’s resolution, I have some Clydeas.